Size: 3.8" x 2.1" x 0.13"
simply add to memory, subtract from memory and display the balance of the memory. When not in use the CheckMaster folds together to a stylish and slim unit that keeps the balance in memory even shut off. Due to high power consumption of the memory the CheckMaster is powered by 6 AAA-size batteries. Dismantling the CheckMaster reveals a MK6225N custom programmed single-chip calculator circuit, a small 7-segment LED display and lot of space for the batteries. Learn more about Mostek Calculator Integrated Circuits. 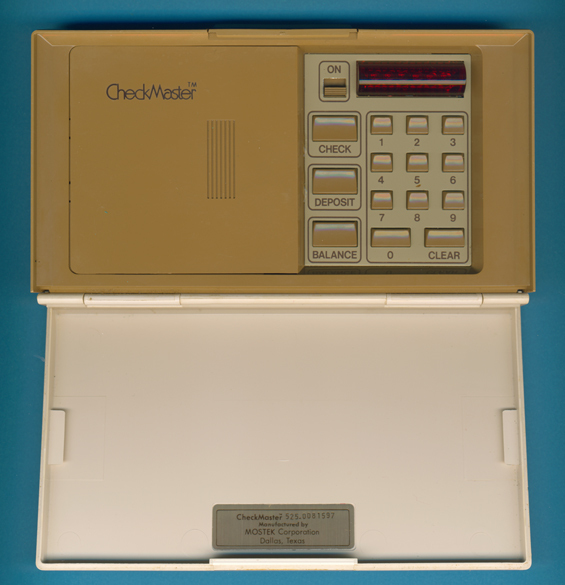 About 7 years later, when the power conserving C-MOS electronics was introduced, a lot of calculators appeared with dedicated check book functions. Don't miss the TI-1880 Checkwriter, TI-2200, Canon Checkbook and some sibblings like the National Semiconductor NS-103 A, the Olivetti Chequebook and the Radio Shack EC-430. Don't miss "real" calculators of the Corvus brand like the 310, 320, 400, 415, 500, and 615 models and the desktop line 300E, 305, and 307. © Joerg Woerner, March 23, 2003. No reprints without written permission.